Beautiful places attract poets and soothe queens. 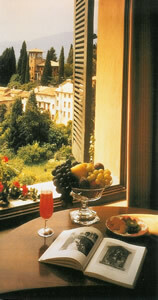 The exquisite hilltop town of Asolo, an hour’s drive north-west of Venice, has done both. Robert Browning discovered this lovely spot in the 1880s and called his last volume of poetry, Asolando (‘For love of the place’). The exiled Queen Caterina Cornaro established here her Renaissance court, famous throughout Europe for its good taste and its musings on courtly love. I felt sure that I would also fall under its spell, as I arrived at the famous hotel at the heart of this glorious place – the Villa Cipriani. This 16 th century edifice (much altered in the 18 th) is the very building bought by Browning in 1889. The versifier might have been ageing by then, but he still had an eye for a good property. Only three minutes by foot from the central square and clinging – as do so many of Asolo’s structures – to the side of the steep hill, you would expect the Villa to have fine views. And it does. This is a lush and fertile part of Italy and greenery dominates the valley below. 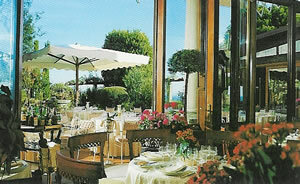 Spilling down the hillside is the hotel garden, a series of well-kept terraces full of flowers and pomegranate trees. It sounds idyllic. And it is. 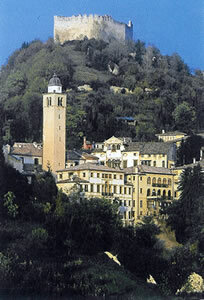 Asolo itself is a joy. I loved wandering through its ancient arcades and then, being easily exhausted by the most modest wander, retiring to the Caffe Centrale on the main piazza – to sip coffee and eat ice cream. (This was an occupation requiring but modest expenditure: 2 americanos and a dish of gelato costing me all of 5 euros.) From my outside table, I could watch the water dribbling out of the Fontana Maggiore opposite. This being Italy, an extra delight was to learn that the fountain was still fed by an aqueduct built by the ancient Romans. But there is pleasure also to be had outside the town. For its location makes it the ideal base from which to tour some of the most important architectural masterpieces of Europe, the villas of Palladio. I drove to Lugo di Vicenza to see his first. 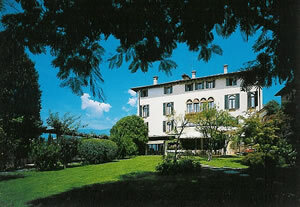 The Villa Godi Valmarana Malinverni was built in 1540. I was enchanted as I walked round its rooms, marvelling at the frescoes by Zelotti and Padovano. And I was enchanted, too, every time I returned to the Villa Cipriani. Its small size (there are just 31 rooms), the décor of warm colours in its public rooms and their abundance of good antiques gave me that feeling I so rarely encounter at hotels – of being entirely at home. It was comfortable upstairs, as well. 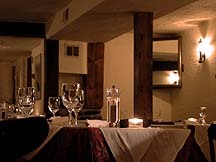 On the second floor, room 37 was a ‘deluxe’ and therefore 420-543 euros a night, according to season, bed and breakfast for two. Nothing flashy or showy disturbed the calm of this apartment of greens and browns. Above the beds hung an engraving of an English hunting scene. Air-conditioned and decently spacious (easily accommodating a sofa and two easy chairs), this was a chamber of quiet good taste. Three features particularly pleased me: the elegance of the 19 th century chest of drawers, the way in which the bedside lights faded on and off and the view from the windows. This last was a generous sweep of gardens, verdant valley and distant hills. For some reason, its contemplation made me hungry – which was useful, for the Villa Cipriani has a notable kitchen, of which I took full advantage. At breakfast I found the buffet table stocked with good cakes, delicious slices of sweet melon and plenty of cheeses and meats. I judged the grilled bacon and tomatoes – brought to me by a friendly waitress – of high quality. In the evening my appetite was further stimulated by the necessary delay of my pre-prandial ablutions. (For some reason, I do not feel it right to dine without having first bathed.) These were undertaken surrounded by the pretty flowers painted onto the tiles of my bathroom. Scrubbed and suited, it was then off to the Villa’s dining room, to be looked after very well by the 2 nd maitre d’ Daniele Dauru. Apart from the champagnes (Krug Grande Cuvée is 170 euros), all 150 wines on the list are Italian. Prices range from 20 euros for a chardonnay from Trentino Alto Adige to 260 euros for 1996 Sassicaia. The prices struck me as very reasonable – for example, the 1998 Brunello di Montalcino from Biondi Santi is 170 euros. All 12 pudding wines are available by the glass at 9·5 euros. Grapes are noted for each wine, and the list is divided into types. 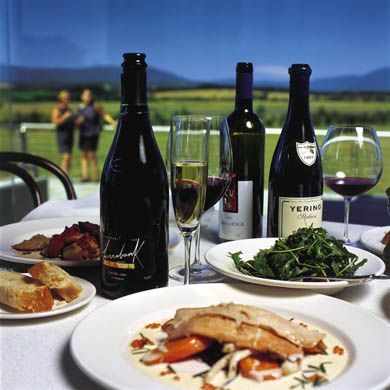 From the ‘White wines of excellence’, I quaffed a local blend of tokay, pinot blanc and sauvignon blanc (Terre Alte, Felluga, 2002 – 45 euros), with a nose of grass, melon and lychees. And from ‘Great Tradition red wines’, I went for one of the super Tuscans from a highly regarded vintage, 1997 Tignanello (120 euros). At first closed and with a rasping dryness in the mouth, this developed into a luscious sweetness of stewed damsons with an excremental nose. Lovely drinking. After breakfast one morning I ran into the enthusiastic young hotel manager, Hermann Gatti. He took me down to the lower ground floor to see the Wellness Space – a swish new facility where, had I been so disposed, I could have indulged in exercise, saunas, massages and beauty treatments. Although I am not myself given to these activities, the concept of wellness came into my mind as I was preparing to leave Asolo. 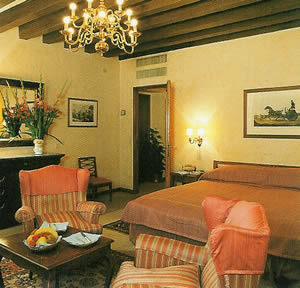 For this beautiful town and its lovely, comfortable hotel – the Villa Cipriani – had made me feel very well indeed. For that, I thank them both. Via Canova 298, Asolo 31011, Italy.